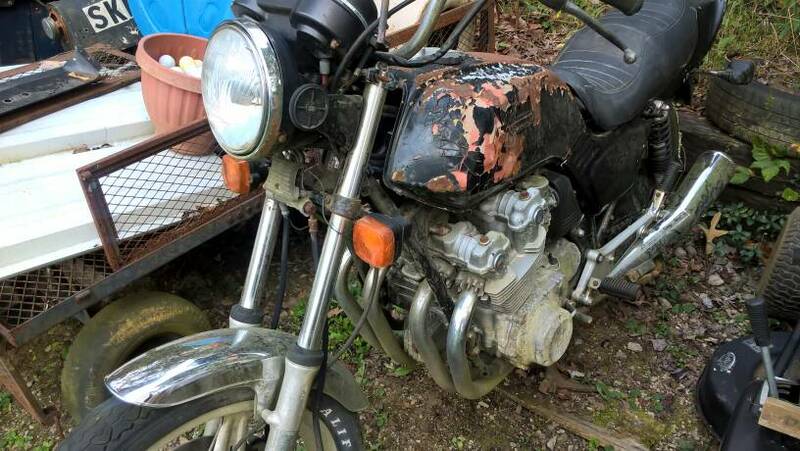 Looked at a '79 CB750F today that has been setting out (uncovered) behind a mobile home for at least two years. He has title for it. Looks like about 1/16" of paint is peeling up from the tank, but the seat looks fair and it all appears to be there. Forks have minor rust above where the seals should run. He is still looking for the key, and I want to look in the tank. I wouldn't try turning it over without oiling cylinders, changing oil, maybe checking valve lash. Thinking for $250 it might make an interesting rat bike winter project. New tires, rebuild the forks, new brake lines and rebuild calipers (and a new front master - this one is shot). IF the motor is Ok, could be good. Brought it home today. Hoping it won't take too much to get it running good. Present plan is to not clean anything that doesn't need cleaned for safe performance (forks, brake pistons, etc.). I'll post up some photos once I get them transfered. Pulled the tank while it was still outside to drain the stinky stale gas. This bike was last tagged in 1999! Surprisingly intact including most of the Honda toolkit. Has had front forks replaced with air loaded forks, so I need to do some sluething about them. Here are a few shots of it when I got it home. Does anyone recognize these forks? The speedo drive was mounted above the axle instead of below it like the CB750F manual and all photos of one that I can find show. I'll take the front axle out and see if I can move the speedo drive to below the axle. I've pulled the calipers off and removed pads to free up wheel rotation. Imagine the brakes are going to be fun to fix. I hate brake work. I hate brake fluid. At least I have a China special master for the front that I was going to use on the Hunley, but it will go on this one. The front reservoir is deteriorated until the sides have crumbled disappeared. Doubt it would ever be resurrected. The plastic is all there, just in terrible shape. Under the black bubbled paint and pink bondo I can see that it was originally one of the silver CB750F Supersport models. Happily, it does NOT have pods and the original airbox has a clean filter in it along with hickory nut shells and some leaves and such. Chain is rusty as can be. Should I soak it or replace it? Sprockets look good - no sharp teeth or broke ones on the rear at least. A major plus - it doesn't look like it has been submerged! Still haven't pulled plugs to lube cylinders, that will come tomorrow with maybe a week wait before I try to bar it over. Nice get. Dont have much advice on your other questions, but as far as the chain goes, just replace it. Cheap insurance. If/ when that sucker breaks going down the road, you could be leaning what it takes to repair or replace an engine case if it wraps around the counter shaft sprocket. Looking forward to seeing what you do with this one! Pulled the stator today. Inside of the case was full of aluminum oxide powder. Small hole in the bottom of the cover from a slide. Still needs more cleaning, but the stator ohms out good as do the field coils. The slip rings look pretty bad and I may pull the field rotor to chuck in the lathe and dress the slip rings. I got the cam cover off (non-standard bolts on the outside corners) and smeared assembly lube on all of the cam lobes, then squirted oil at the cam bearings and chains. Some bright "mechanic" shoved a sheet metal screw in to hold the tach cable, and cracked that tower. I think that it can be patched up with JB, and a standard 5mm fine still screws down into it. Plugs out 1st thing this morning, and PBBlaster squirted in. That set until this afternoon, and I bared the crank over. A little scratchy sounding at first. Smoothed out nice after a couple turns. Put motor oil down each hole and will roll it again tomorrow. P.O. claimed to have replaced the reg-rec. I really like this charging system better than the GL1000, which has an alt that puts out 100% and the reg/rec shorts excess to ground. Are those forks off a C model by any chance? I don't recall any F models with that design. Those look like Koni rear shocks.